I've started to think about holiday menus. The other day while shopping, I was greeted by a sales associate reminding me that there are only ten weeks until Christmas. What happened to Halloween? What happened to Thanksgiving? Yes, it is true that the fall and winter holidays my family celebrates come in rapid succession, but I do like to deal with them one at a time. Even so, I like to start thinking about my dessert options for our family celebrations well in advance. 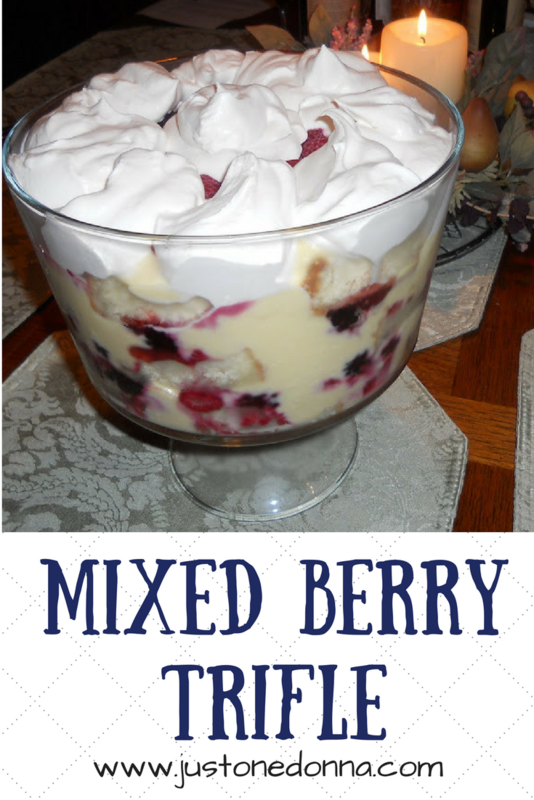 One of my favorite celebration desserts is this mixed berry trifle. Do you want a delicious, fancy-pants dessert? This mixed berry trifle is as delicious as it is pretty. 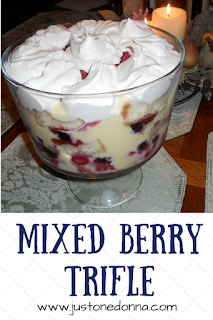 The mixed berry trifle starts with a buttery pound cake. You can make your own or buy a prepared pound cake. I suggest you make your pound cake in advance and freeze it so you have it ready when you need it. The element that makes all the difference with this dessert is the Cognac cream. There is only one teaspoon of Cognac in the recipe but it adds so much flavor it would be a shame to leave it out. You can double the vanilla if you prefer. Frozen berries work in this recipe. Berries can be expensive during the fall and winter. I have found beautiful frozen berries that have been perfect in this trifle. You'll want to choose the best strawberries, blackberries, and raspberries you can find. If you choose frozen berries, treat your bags of berries gently so that the berries don't get broken into pieces. The crowning glory for the trifle is the pillows of fresh whipped cream placed in dollops over the top of the trifle. Make your own whipped cream for this very special dessert. You can be fancy and pipe your whipped cream over the top of your trifle, but I really like the easy casualness of the spoonfuls of whipped cream. Preheat the oven to 350 degrees F. Grease and flour two (8 1/2 x 4 1/2 x 2 1/2-inch) loaf pans. Line the bottoms with parchment paper for easier removal from the pan. Cream the butter and granulated sugar in the bowl of an electric mixer fitted with the paddle attachment for about five minutes, or until light and fluffy. With the mixer on medium speed, beat in the eggs, one at a time. In a large bowl, sift together the flour, baking powder, baking soda, and salt. In another bowl, combine the buttermilk and vanilla. Add the flour and buttermilk mixtures alternately to the batter, beginning and ending with the flour. Divide the batter evenly between the pans, smooth the tops, and bake for 45 minutes to 1 hour, until a cake tester comes out clean. Don't over-bake. When the cakes are done, let them cool for 10 minutes. Take them out of the pans, place them on a baking rack and allow them to cool completely. Wrap well, and store in the refrigerator or freezer. In my opinion, the Cognac cream is essential to your trifle. It adds just enough Cognac flavor to make a difference. If you prefer, omit the Cognac and double the vanilla. Beat the egg yolks and sugar on medium-high speed in the bowl of an electric mixer fitted with the paddle attachment until pale and thick, about five minutes. With the mixer on low speed, sprinkle on the cornstarch. Beat on medium-low speed until combined, scraping down the bowl with a rubber spatula. With the mixer on low speed, slowly pour the hot milk mixture into the egg mixture. Pour the mixture back into the pan. Cook over medium heat, stirring constantly, until the mixture thickens, five to seven minutes. I cook on an electric stove. I found heating the mixture on medium heat worked best. You really want the mixture to get very hot. You'll feel it thicken up to pudding consistency. Don't rush this step. Immediately, pour the mixture through a fine sieve into a large bowl. Stir in the vanilla, Cognac, butter, and heavy cream. Stir to combine. Go ahead and stick your finger into the cream to taste. You know you want to. Yummy! Place plastic wrap directly on the custard to keep it from forming a skin. Refrigerate until cold. This step can be done a day in advance. Cut the pound cake into nine (3/4-inch) slices. You may find it helpful to cut each slice into 3 pieces to be able to fit them more snugly into your serving bowl. Spread each slice on one side with raspberry jam, using all the jam. Make sure you use a good quality seedless raspberry jam. Set aside. Place a layer of cake, jam-side up, in the bottom of a 2 1/2-to 3-quart glass serving bowl, cutting the pieces to fit. Sprinkle the cake with Framboise. Top with a layer of berries and Cognac Cream, using one-third of each. Repeat the layers of cake sprinkled with Framboise, then the berries and Cognac Cream, ending with a third layer of cake placed jam-side down and then the mixed berries. Whip the heavy cream in the bowl of an electric mixer fitted with the whisk attachment. When the cream starts to thicken, add the sugar and vanilla and continue to whip until it forms stiff peaks. Decorate the trifle with the whipped cream. Chill until ready to serve. You can get fancy with your whipped cream, but I didn't. Generous spoonfuls placed around the top look lovely as well.